As we prepare to enter a strange new world next year I want to end this year with the figure from “Houston, We Have A Narrative” that underlies pretty much everything we are now dealing with. 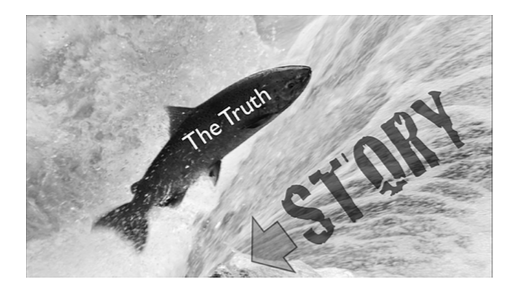 Our information glutted world has turned “The Creek of Story” into “The Raging Whitewater Torrent of Story.” The polls show clearly who is the casualty — the tiny fish of truth. But by “story” I’m not referring to lying. I’m referring to story structure. It doesn’t mean you need to lie, only that you need to understand the narrative selective regime in which we now live. “Just the facts” no longer works, as sadly shown by the losing Presidential candidate who tried to pursue that approach. From here on, it’s all about story. FROM HERE ON, STORY WINS. END OF STORY. There’s mountains of stuff now spewing out about the “post-factual world,” fake news and “post-truth politics.” Wikipedia even has a page for the latter. I have only one simple thing to add to the mix. It’s the visual (above) that was in my book last year, “Houston, We Have A Narrative.” I suppose I might modify that figure to have two fishes — one labeled NARRATIVE (ABT, And-But-Therefore) that is succeeding in beating the river. The other labeled NON-NARRATIVE (AAA, And-And-And) that is being swept downstream. Hillary Clinton ran a “stunningly boring campaign” as the UK Telegraph and many other media outlets put it. Her VP selection, Tim Kaine, was uber-boring. You CAN NOT DO THAT in the United States and expect to win. It’s an intensely narrative culture we have created. My Story Circle co-creator Jayde Lovell and I are assembling the data and argument for the process of “narrative selection” — the fact that we live in a narrative selective regime — those who fail to comply get selected against. These are my watch words for the new year — the Narrative Imperative. Donald Trump has deep narrative intuition, as I talked about on Park Howell’s podcast “The Business of Story” the morning after the election. This underlies the fundamental dynamic between the right and the left. The left has the statistics showing how rare terrorists attacks are in America, but the right has the handful of stories of terrorist attacks that are absolutely terrifying. Story wins. That’s the bottom line for 2017: Story wins.